The saliva circulating in the mouth at any given time is termed as whole saliva and comprises a mixture of secretions from the major, minor salivary glands and traces from the gingival crevicular fluid. To a large extent, it promotes oral health, whereas lack of its secretion contributes to the disease process. , It is a heterogeneous fluid comprising of proteins, glycoproteins, electrolytes, small organic molecules, and compounds transported from blood. Since this fluid constantly bathes the teeth and oral mucosa, it acts as a cleansing solution, a lubricant, buffer and ion reservoir of calcium and phosphate, which is essential for re-mineralization of initial carious lesions. Hence, this study was carried out to determine the physio-chemical properties of saliva and their relation with dental caries in children. To evaluate the relationship between physio-chemical properties of saliva such as flow rate, buffering capacity, pH, calcium level in caries-free and caries-active children. To evaluate the relationship between Streptococcus mutans a and its relationship with dental caries. The present study was conducted in the Department of Pedodontics and Preventive Dentistry, Darshan Dental College and Hospital in collaboration with Jyothi Public School, Fatehpura Udaipur (Rajasthan). Eighty children of age 7 to 14 years were included as subjects in the study. Prior to the collection of saliva from the children, an informed consent was obtained from their respective parents, and detailed case history was recorded. Eighty children were selected and divided into two groups of 40 each. Each group having equal number of caries-active (group 1) and caries-free (control group) children. Groups were further subdivided into 20 each based on male and female category. Caries status of each child was scored by using DMFS and dfs indices to get a combined DMFS and dfs score. Children with DMFS = 0 were taken as caries-free, and children having at least five decayed tooth surfaces requiring restoration were taken as caries-active subjects respectively. On the day of collection of saliva, participating children were instructed not to eat or drink anything for at least one hour before the collection of saliva sample. To control the circadian variations, samples were collected between 10 am-11.30 am. Children were asked to rinse their mouth with water thoroughly 10 minutes before collection of saliva to avoid the contamination of food debris. 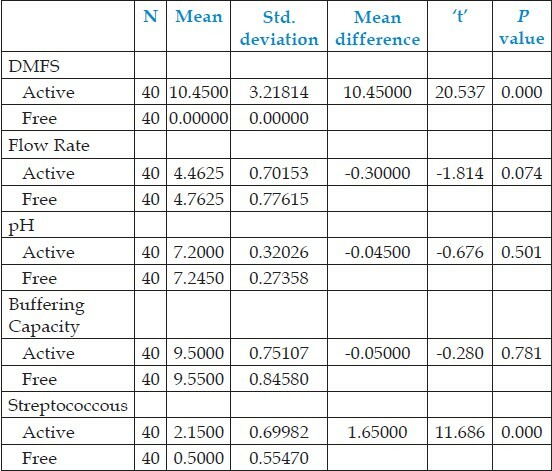 Each sample was estimated for flow rate, pH, buffering capacity using Saliva Check (GC Asia Dental Pte Ltd- India) and Streptococcus mutans using Dentocult SM Strip Mutans. The results of the study showed, that there was a statistically significant difference in the mean DMFS in caries-active and in caries-free subjects. The mean flow rate in caries-active subjects was 4.4625 and in caries-free subjects was 4.7625. The difference was statically not significant where P value was 0.074 (P > 0.05). Mean pH in caries-active subjects were 7.2000 while in caries-free subjects were 7.2450. The difference was not statistically significant where P value was 0.501 (P > 0.05). Mean buffering capacity in caries-active subjects was 9.5000 while in caries-free subjects was 9.5500. The difference was not statistically significant with P value 0.781 (P > .05). The mean total calcium concentration of saliva in caries-active subjects was 8.0825 while in caries-free subjects was 8.8375. The difference was statistically significant, P value 0.011 (P < .05). The mean Streptococcus mutans count in caries-active subjects was 2.1500 while in caries-free subjects was 0.5000. The difference was statistically significant, P value 0.000 (P < .05) [Table 1]. Good oral health is an integral component of good general health. Although enjoying good oral health includes more than just having healthy teeth, many children have inadequate oral and general health because of active and uncontrolled dental caries. The etiology and pathogenesis of dental caries is multifactorial. Hence, this study was done with the objective to evaluate the role of flow rate, pH, buffering capacity, calcium level and Streptococcal mutans level of saliva in dental caries assessment. Studies have shown that patient with low or no caries activity had a resting salivary pH of around 7.0 and those with extreme caries activity had a resting pH below critical pH 5.5. In the present study, the mean pH in resting saliva in caries-active subjects was 7.2000, which was not sufficient to cause the demineralization of inorganic substance of the tooth. Similar results were seen in study conducted by Tuhunoglu O.S. (2006),  which showed no correlation between pH values and caries activity, age and gender. Our study was in contrast to the study conducted by Ericsson (1959),  which showed that salivary buffering capacity has a negative relationship with caries incidence. Another study conducted by Lagerlof and Oliveby (1994)  showed that a low flow rate combined with low or moderate buffer effect clearly indicates poor salivary resistance against microbial attack. This can be attributed to the fact that the pH of the secreted saliva is dependent on the secreted acids and bases, most notably the bicarbonate ion. In the present study, the mean Streptococcal mutans count in caries-active children was increased and showed statically significant difference in comparison to caries-free children (P < 0.05). In a study conducted by Behiye SB, Sema C, Buket EA, Fatma A (2004)  on associations of dental caries with salivary mutans streptococci/lactobacilli and plaque ph in 7-9 years old children in rural of diyarbakir-turkey, they found that increase in the number of mutans streptocci has indicated the increasing number of caries lesions. This was in line with the clear evidence from the studies by Mattos-Graner et al. (1998),  in Brazil and by Alaluusua and Renkonen (1983)  in Sweden that children with high numbers of MS develop a significantly higher caries incidence than children with low numbers. A study conducted by Hegde SK et al. (2005)  showed that there was a statistically significant positive co-relation between the percentage of salivary bacteria (S Mutans) and dental caries, which was similar to our study. Another study conducted by Hedge PP et al. (2005)  on dental caries experience and salivary level of Streptococcus mutans and lactobacilli in 13 to 15 years of children of Belgaum city showed a highly significant statistical relation between Streptococcus mutans and dental caries, which correlated to our study. No other etiological factor can influence the outcome of dental caries, as much as the saliva can do. There is a general agreement among dental professionals that the salivary secretion and substance secreted with saliva influence to a high degree the strength of an individual caries attack. The epidemiological surveys and experimental studies are gradually increasing our understanding and awareness of the impact of saliva on oral health. Flow rate, pH, and buffering capacity of saliva in caries-active children were decreased but not statistically significant. The Streptococcus mutant count of saliva was increased significantly in caries-active children. Dental caries is a complex and dynamic process where a multitude of factors influence and initiate the progression of disease. Most important factors which influence the development of dental caries are dietary habits and saliva. The physio-chemical properties of saliva like pH, buffering capacity, salivary flow rate, concentration of various components like proteins, calcium, and antioxidant defense system play a major role in the development of caries. Hence, more clinical and laboratory studies are needed to determine the exact relationship between these physio-chemical properties of saliva and dental caries. 1. Gandhy M, Damle SG. Relation of salivary inorganic phosphorus and alkaline phosphatase to the dental caries status in children. J Indian Soc Pedod Prev Dent 2003;21:135-8. 2. McDonald RE, Avery DR, Stookey GK. Dentistry for the child and adolescent. 8 th ed. New Delhi: Elsevier; 2005. p. 203-35. 3. Shafer, Hine, Levy. Shafer's Textbook of Oral Pathology. 5 th ed. Philadelphia: Saunders; 2002. p. 567-658. 4. Lavelle LB. Christopher Applied oral physiology. 2 nd ed. London, UK: Butterworths and Co. (Publishers) Ltd.; 1988. p. 128-41. 5. Battino M, Ferreior MS, Gallardo I, Newman HN, Bullon P. The antioxidant capacity of saliva. J Clin Periodontol 2002;29:189-94. 6. Lundqvist C. Oral sugar clearance; its influence on dental caries activity. Odontol Revy Suppl 1952;3:11-116. 7. Lanke LS. Influences on salivary sugar of certain properties of food stuffs and individual oral conditions. Acta Odontol Scand 1957;15:154-6. 8. Lagerlof F, Oliveby A, Ekstrand J. Physiological factors influencing salivary clearance of sugar and fluoride. J Dent Res 1987;66:430-5. 9. Gopinath VK, Rahim AA. Saliva as a diagnostic tool for assessment of dental caries. Arch Orofac Sci 2006;1:57-9. 10. Lenander-Lumikari M, Loimaranta V. Saliva and Dental Caries. Adv Dent Res 2000;14:40-7. 11. Tulunoglu O, Demirtas S, Tulunoglu I. Total antioxidant levels of saliva in children related to caries, age, and gender. Int J Paediatr Dent 2006;16:186-91. 12. Ericsson Y. Clinical investigations of the salivary buffering action. Acta Odontol Scand 1959;17:131-65. 13. Bolgul BS, Celenk S, Ayna BE, Atakul F. Associations of Dental Caries with Salivary Mutans Streptococci/Lactobacilli and Plaque pH in 7-9 Years Old Children in Rural of Diyarbakýr-Turkey. Turk Clin J Dent Sci 2004;10:69-73. 14. Mattos-Graner RO, Zelonte F, Line RC, Mayer MP. Association between caries prevalence and clinical, microbiological and dietary variables in 1.0 to 2.5 year old Brazilian children. Caries Res 1998;32:319-23. 15. Alaluusua S, Renkonen OV. Streptococcus mutans establishment and dental caries experience in children from 2-4 years old. Scand J Dent Res 1983;91:453-7. 16. Hegde SK, Kumar KB, Sudha P, Bhat SS. Estimation of salivary bacteria capable of inhibiting and stimulating Streptococcus mutans, and its correlation to dental caries and untreated carious teeth. J Indian Soc Pedod Prev Dent 2005;23:126-30. 17. Hegde PP, Ashok Kumar BR, Ankola VA. Dental Caries experience and salivary levels of Streptococcus mutans and Lactobacilli in 13-15 years old children of Belgaum city, Karnataka. J Indian Soc Pedod Prev Dent 2005;23:23-6.